Do not directly feed crocodiles. It is illegal, extremely dangerous, and fed crocodiles start to look for people for food. Do not toss food scraps into the water or at the waters’ edge. This means all food waste, not just fish and chicken. While one may think that last night’s rice and beans will not attract a crocodile, it does attract fish and raccoons which are the crocodiles’ main sources of food. This also leads to pets being attacked by accident. Stand safely from the waters edge when fishing. When you sit by the water’s edge you appear smaller to the crocodile; and thus, may be considered prey. Clean fish at home, or at least collect the scraps and carry them out to sea to dump. Cleaning fish at the waters edge draws crocodiles closer to people. This is the number one reason people get attacked by a crocodile. Refrain from swimming in murky water, especially at dusk and dawn. Crocodiles are searching for food at these times of day and night. Be aware of crocodile tracks such as slide marks, foot prints, and tail drags. Be alert near them. Keep hands and feet inside the boat, especially when fishing. Crocodiles are important because they eat the sick and slower fish, keeping Belize’s fish populations healthy for us; and, they eat raccoons which are over populated and carry diseases and parasites that we can catch. 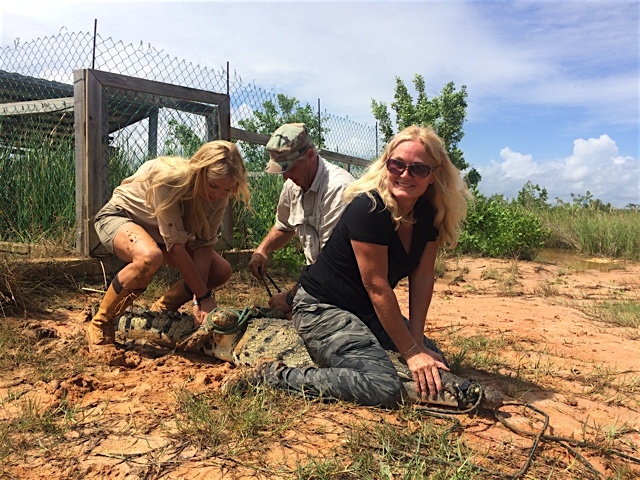 There are currently other researchers other than ACES on Ambergris Caye who are investigating crocodile parasites to help determine the health of the crocodile population and the environment. If you have a crocodile concern, you can call the Belize Forest Depart at 822-2079, ACES at 623-7920, or the Belize Wildlife Network at 0800-822-888. ACES is a non-profit organization permitted by the Belize Forest Department (BFD) since 2006; and as of 2013, operates within a Memorandum of Understanding with the BFD under the Ministry of Forestry, Fisheries and Sustainable Development, to cooperate and work hand in hand in partnership with the government for the proper management, rehabilitation, conservation, and protection of crocodilian species in Belize. 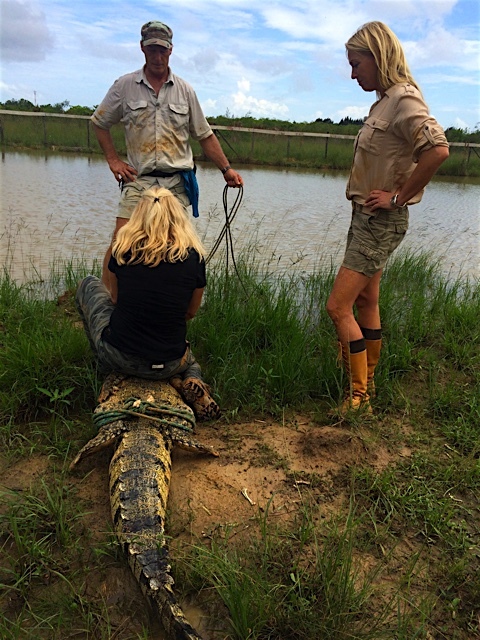 Since 2008, ACES has been humanely tagging crocodiles via microchips and the scute clip method for an ongoing population distribution study. To date over 500 crocodiles in Belize have been tagged providing researchers with pertinent scientific data; and more importantly, identifying problematic crocodiles for relocation or captivity to ensure human safety. Thanks to recent grants from La Fondation Brigitte Bardot, who supports ACES’s crocodile conservation efforts on an annual basis, and the Hygeia Foundation for Health, Science, and the Environment, Inc., ACES is currently expanding to the Sandhill area where larger, secured, habitats provide more room for the ever growing captive crocodiles. This new facility will included a new natural home for “Jaws,” whose jaw was broken by humans and rescued in 2010, and a hatchling head start habitat for rescued crocodile hatchlings and eggs. ACES thanks all those who continue to support our crocodile conservation efforts!